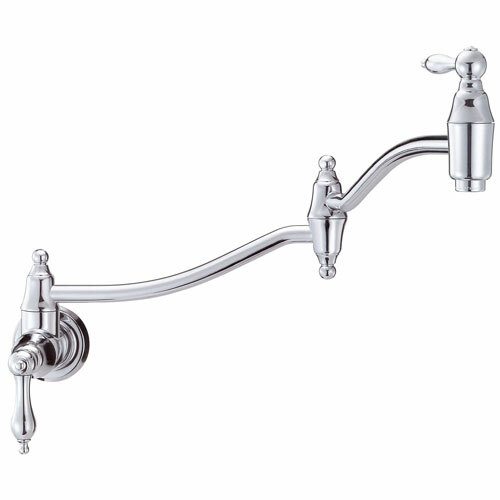 Danze Fairmont Chrome Wall Mount Traditional Pot Filler Faucet: This Danze Fairmont Collection Pot Filler Faucet is built to last. The highest quality standards are used to precision manufacturer a top of the line fixture. Important features of this 100% BRAND NEW Fixture: Complete Item! Everything necessary for installation is included. Chrome Wall Mounted Traditional Pot Filler Faucet - 2 Handle Pot Filler Faucet Fairmont Collection Wall Mount Lever Handle - For those after a more traditional look, we've redesigned our Fairmont faucets to be more stylish than ever. Our Fairmont two handle wall mount pot filler is no exception. Signature details set it apart from other faucets, and will do the same for your home. - two handle design for quick and easy water control - Two ceramic disc valves provide smooth water flow - Chrome premier finish designed to resist fading and tarnishing. - Spout reach extends up to 22 in. for complete counter access - 2-piece articulated spout folds out of way when not in use - ADA compliant for easy operation - Two (Double) Handle Faucet - Matching Accessories Available - Easy to Install - Installation instructions included. This fixture is manufactured by Danze and is part of their Fairmont Collection. For those after a more traditional look, we've redesigned our Fairmont faucets to be more stylish than ever. Our Fairmont two handle wall mount pot filler is no exception. Signature details set it apart from other faucets, and will do the same for your home.